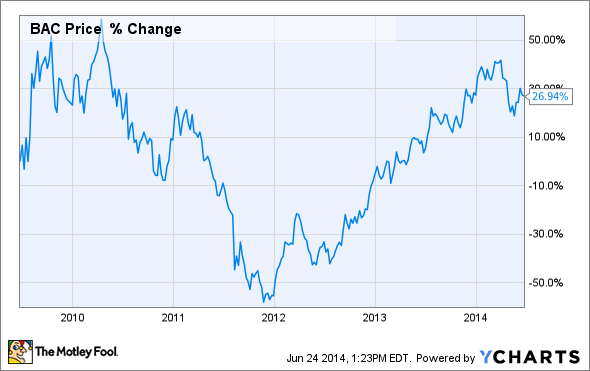 Here's the reason you should probably avoid Bank of America's shares at the current price. I think it's fair to say that most analysts and commentators are bullish on shares of Bank of America (NYSE:BAC). And while I respect their opinions, I also believe they're wrong. The error in their collective analysis is that they've largely ignored, or otherwise diminished, the two most important variables that dictate a bank stock's long-term shareholder returns. It's a bit like baking a cake with salt instead of sugar -- that is, you'll likely discover the mistake only after it's too late to fix it. With this in mind, I've set out to demonstrate not only where the collective judgment on Bank of America is right, but also specifically where and why it's wrong. And while I'm hesitant to make any guarantees, I believe that a reader who makes her way through this column will emerge with a rare appreciation for the precise factors behind the world's best bank stocks. The argument in favor of buying stock in the Charlotte, N.C.-based bank goes something like this. Bank of America overseas a collection of the most valuable and recognizable franchises in the American financial services industry. These range from its well-known consumer-banking business to investment banking to its industry-leading wealth management division acquired via its 2008 purchase of Merrill Lynch -- click here for a recent in-depth rundown of Bank of America's business divisions. The one exception to this is its consumer real estate division, which has been responsible for the majority of Bank of America's woes since the financial crisis. Fortunately, so the argument goes, these troubles have almost completely been atoned for following a corporate reorganization, tens of billions of dollars' worth of legal settlements, and the bank's decision to abandon the mortgage products and third-party lending channels that are widely (and accurately) attributed with causing the debacle. Given this progress, the argument continues, it's clear that Bank of America's shares are "cheap" because they trade for a large discount to better-heeled competitors like Wells Fargo (NYSE:WFC) and JPMorgan Chase (NYSE:JPM). For instance, shares of Wells Fargo trade for 1.72 times book value, while Bank of America's trade for a miserly 0.74 times book. It's urged this gaping divide will compress once interest rates increase, and thereby boost Bank of America's net interest income on its trillion dollars' worth of deposits -- once its remaining legal woes are finally in the rearview mirror, and once investors and analysts stop vilifying Bank of America for its previous misdeeds. Now, just to be clear, I don't necessarily disagree with any of these premises. At various points over the last few years, in fact, I've both owned Bank of America shares and made many of the same arguments myself. Had you asked me two years ago or even last year, I would have been the first to say that Bank of America was a "buy." The problem is, its share price has risen considerably since then. Over the last year, it's up by 27%. Over the last two years, it's up by 97%. And since bottoming out at the end of 2011, it's up 213%. There's no getting around the fact that this makes Bank of America's stock a significantly riskier and less profitable investment going forward. If you already own it, then you're likely sitting on considerable gains and thus have a comfortable margin of safety. But if you're thinking about buying now, you don't have this same cushion. On top of this, while all of the bullish arguments are individually valid, they don't support the conclusion that Bank of America is a good investment at today's price. By "good investment," I mean one that promises outstanding investment returns relative to competitors -- this last (italicized) part is extremely important, because you should always consider the opportunity cost of investing in one stock relative to another. Indeed, the problem with most mainstream bullish arguments for Bank of America is that all of them miss the most important points. The purported value or dominance of various business lines is a subsidiary issue; it's necessary but not sufficient to produce outstanding returns. And the same can be said of Bank of America's outstanding deposit franchise, as well as its ongoing efforts to cleanse its balance sheet of legacy assets dating back to the financial crisis. Ironically, the issue here is that most of these things drive revenue. And, while you may be surprised to hear this, revenue isn't correlated to how well a bank stock performs over the long run. Yes, you read that right; there is essentially no correlation between a bank's revenue and its shareholders' long-term return on investment. Boosting revenue at a bank is easy -- embarrassingly easy. This is because a large portion of revenue at most banks (Bank of America included) stems from lending. Consequently, if you're a banker set on boosting revenue, which most bankers are, all you have to do is reduce your credit standards and make more loans at lower interest rates. Sound familiar? It should, as this is the very behavior that produced the financial crisis. And, for the record, the 2008 crisis was hardly an anomaly, as financial history is littered with similar panics that have caused the downfall of thousands of banks irrespective of the size, power, and prestige of their reputations, business lines, or deposit franchises. The problem is that loose lending with an eye toward boosting revenue invariably sows the seeds of subsequent destruction in shareholder value, either through a complete failure (e.g., Washington Mutual) or through egregious dilution of shareholders (e.g., Bank of America and Citigroup). Indeed, in the last crisis, there were only a handful of large banks across the country that escaped similar fates. For fans of Warren Buffett, this is what he refers to on multiple occasions throughout the years by writing, "You only find out who is swimming naked when the tide goes out." In this case, the tide serves as a metaphor for the credit cycle. At this point, you may be wondering: If revenue doesn't matter, what does? There's a part of me that wishes the answer to this was complicated, but the truth is that it's deceivingly obvious. Namely, what matters is how much revenue a bank is able to shuttle to the bottom line over multiple cycles. If you break this down further, there are two components to it. First are operational expenses. The metric used to measure this is the efficiency ratio, which gauges the percent of revenue (or, more specifically, pre-tax pre-provision profit) that's consumed by noninterest expenses like salaries, rent, and incidentals. Speaking very generally, what you're looking for is a ratio in the 50% to 60% range. U.S. Bancorp (NYSE:USB) serves as a textbook example. The massive regional bank headquartered in Minneapolis, Minn., regularly reports a ratio within a hair's breadth of 50%. This means that roughly half of every dollar in revenue ultimately makes its way to U.S. Bancorp's shareholders by way of dividends, buybacks, or book value appreciation. And the same can be said of other top-shelf American lenders. In 2013, Wells Fargo's efficiency ratio was 58%, M&T Bank's was 57%, and thanks to a unique business model focused on large multifamily developments, New York Community Bancorp's came in at an astounding 43%. So, how does Bank of America stack up? It's on the other end of the spectrum, with an efficiency ratio in 2013 of 77% -- though, to be fair, this was certainly an improvement over 2012, when it was 86%. With this in mind, it should come as no surprise that Bank of America's shareholders have fared considerably poorer over the years than the shareholders of its more efficient competitors. This brings me to the second main driver of shareholder returns for a bank -- prudent management of credit risk (or, more tangibly, loan losses). To be clear, that I'm discussing this after the efficiency ratio shouldn't be interpreted as a sign that risk management is less important. In fact, nothing could be further from the truth, as a bank's history of loan losses is the single most important variable when it comes to predicting a bank's long-term returns. This is something I analyzed at the end of last year, and the results were staggering. Not only were loan loss provisions highly correlated with profitability at the nation's 18 largest lenders between 1995 and 2012, the correlation was leaps and bounds tighter than any other metric. I won't get into the statistical details now, as you can access the article I wrote on it here, but provisions were more than twice as correlated to compound annual returns over this period, relative even to asset growth! The reason for this is simple. To Buffett's point about the tide, when the credit cycle turns against an imprudent lender, one of two things will inevitably occur. Either the lender will go out of business completely, or it will be forced to dilute shareholders by raising capital at the worst possible time -- that is, after its share price has plummeted because of suspicions or actual revelations about the quality of its loan book. This is the reason former industry darlings like Bank of America, Citigroup, and Huntington Bancshares decimated shareholders following the financial crisis, as they were in desperate need of capital to fill the gaping holes in their balance sheets left by soaring commercial and residential loan losses. Now, the bullish argument is that lenders like this learned their lesson and aren't apt to repeat the same mistake in future cycles. By this line of reasoning, in other words, these are probably the safest banks to invest in -- far more so than, say, a U.S. Bancorp or Wells Fargo, both of which emerged from the financial crisis bigger and stronger. In support of the former proposition, some analysts will cite statements by bank management that things are different. If you find this absurd, then you're in good company, as I do as well. But for those of you who aren't in agreement, let me offer two points. First, what do you expect management to say? And second, the sentiment behind statements like these may be genuine, but they're nevertheless naive and likely to be disproved during the next cycle. According to my reading of history, once poor lending standards or some other form of imprudent risk management take hold at a bank, they can't be easily eradicated. And by "can't be easily eradicated," I mean that it would be manifestly (small "f") foolish to think otherwise. There are few banks that prove this as well as Citigroup, which has found itself hobbled (and existentially so if it hadn't been for repeated government bailouts) in most if not every financial calamity since and including the Great Depression. My point is that if you want to forecast how a bank will perform in the next credit cycle, you should look at how it performed in the last one, and not base your opinion on self-interested statements of management. And, at least on this count, I hope we're all in agreement that Bank of America has left a lot to be desired over the last few years. After all of this, I'd urge you to take two things away from the discussion above. First, I hope to have demonstrated why Bank of America, at today's price, is probably not the bank stock a typical investor wants in their portfolio. If it were patently cheap as it was two years ago, the story would be different. But it no longer is. Consequently, do yourself a favor and stick with lenders that have demonstrated histories of behaving appropriately throughout all stages of the credit and interest rate cycles. As I've already mentioned, the four that come immediately to mind are U.S. Bancorp, Wells Fargo, M&T Bank, and New York Community Bancorp. And the second point is that you should be particularly wary when analyzing the banking sector (or reading another's analysis of it), as the same rules that govern most other industries -- and specifically with respect to maximizing revenue -- can often produce the opposite result when it comes to the business of lending.